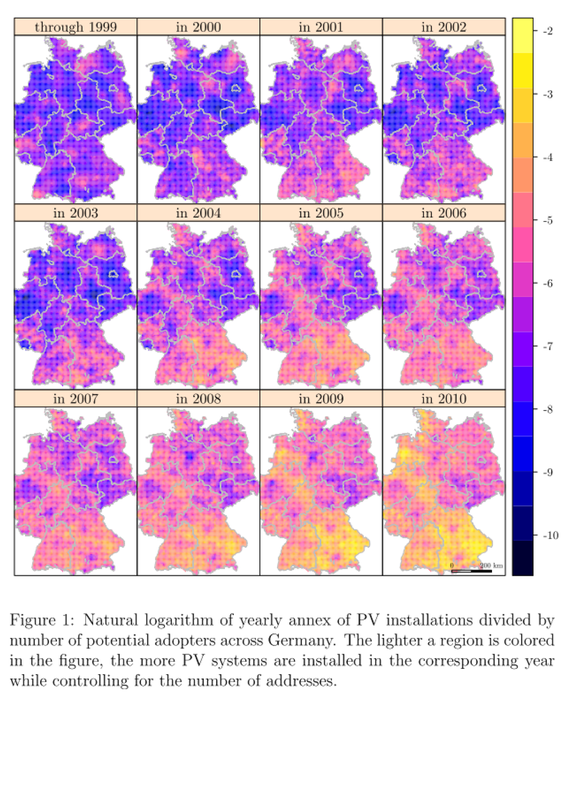 Presentation on Diffusion of Photovoltaic Installations in Germany is given at 2014 annual international conference of the German Operations Research Society (GOR) in Aachen, Germany, on Friday 5th of September 2014. The purpose of this study is to investigate factors on the very local level (households, addresses) that determine whether or not photovoltaic systems - solar cell systems to generate electricity - are to be installed on buildings. We consider a case study of Germany. We aim to identify if the decision of households to install photovoltaics can be explained by peer effects measured by pre-existing proximate installations (also known as the installed base). Since our analysis is based on individual decisions of households, we employ a discrete choice model with panel data in order to model the decisions whether to install in a certain period or not. We employ a geocoded data set of 21 million addresses and the grid-connected photovoltaic systems set up in Germany through 2010 (we consider 11 periods). In total, our data set used for analysis comprises nearly 210 million observations. Our analysis reveals a positive influence of previously installed systems located nearby on the decision to install a photovoltaic system. However, this effect decreases in time. We present an outlook on how our model can be used for forcasting purposes and locational decision making. Finally, a concept is proposed how Google Trends data can be used within our model.